The whole process went smoothly without incident thanks in part to a very skilful crane operator. 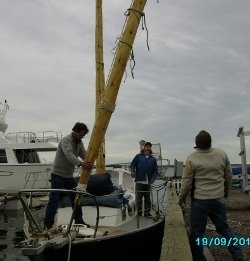 After some adjustment of the step wedges the masts seem to be center aligned and the foremast with a 5% (more or less) forward rake. 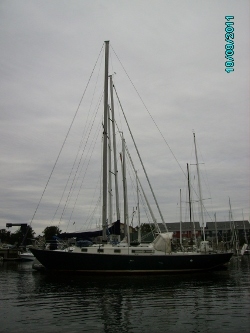 Now I have to shape and fit wedges around the mast at the partners and fit a mast boot/coat to keep the rain out. This is a major milestone in the project and I feel it’s all downhill from here. In the remaining time I have here (flying home on Halloween) I will work on constructing the yards, battens, booms and sails. I fly back on May 1 (leaving the boat on the hard for the winter) and will finish any left over work and begin the sea trials. When all the bugs are ironed out I plan to do some cruising around Newfoundland before heading back to Ireland and Wales. 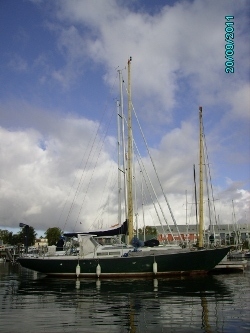 This entry was posted in alberg 37, junk rig, masts and tagged alberg 37, junk rig, masts. Bookmark the permalink.